Ghosale sukke - As I always buy plenty of ridge gourds from market, I make simple ghossale sukke several times which goes well with rotis. Ridge gourd is a bland vegetable and therefore it is necessary to add flavour and taste to it. When I make this upkari without adding water and cooked it in its own juice, it really turns a tasty side dish. Here I have flavored the stir fry with tadka, green chilli and freshly grated coconut. Another plus point of this dish is that it can be prepared within few minutes and is very healthy. Whenever I am in a hurry to cook, I make such stir fry and wind up my cooking as fast as I can. Check out another variation of ridge gourd palya which I had posted earlier. Wash and peel the ridge gourds. Cut them into small pieces and set aside. Heat the oil in a pan. Add the mustard seeds to it. When the mustard starts spluttering, add the curry leaves and chopped green chillies to it. Saute for few seconds. Then add the ridge gourds and stir nicely for a minute. Add salt and mix well. Cook covered on low flame till the ridge gourds become soft. Once the ridge gourds become soft, add the grated fresh coconut and mix well. Saute for a minute and remove from the flame. Serve the ghosale sukke hot with rotis. 1. Wash and peel the ridge gourds. 2. Cut them into small pieces and set aside. 3. Heat the oil in a pan. Add the mustard seeds to it. 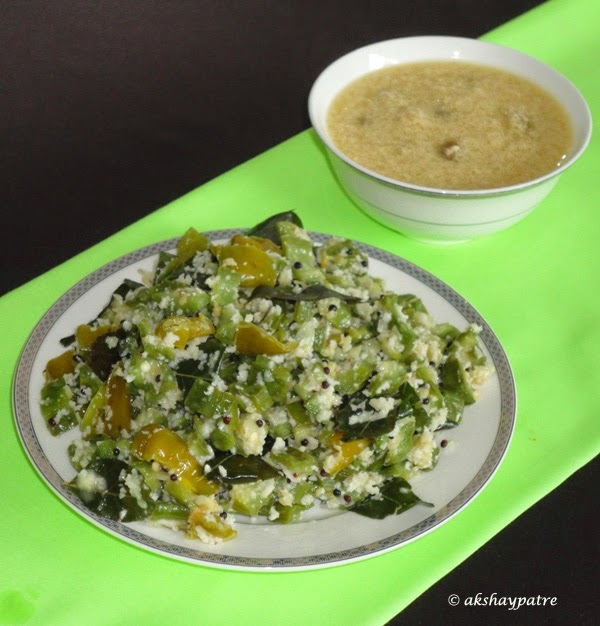 When the mustard starts spluttering, add the curry leaves and chopped green chillies to it. Saute for few seconds. Then add the ridge gourds and stir nicely for a minute. Add salt and mix well. 4. Cook covered on low flame till the ridge gourds become soft. Once the ridge gourds become soft, add the grated fresh coconut and mix well. Saute for a minute and remove from the flame. 5. Serve the ghosale sukke hot with rotis. Yummy and healthy side dish for rice. 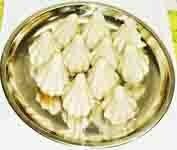 Oh You don't peel the ridge gourd fully ..Does the peel stuck in teeth while eating ,Just curious ..
Sathya, what a funny question :) The peel won't stuck between teeth. For that it is need to be cooked very soft and while eating you have to bite and chew it nicely. 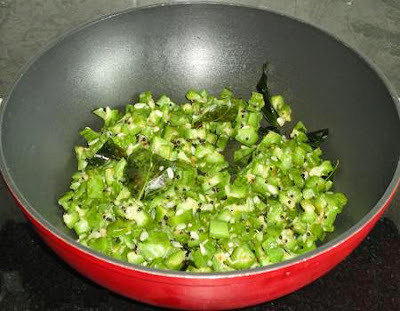 We make ridge gourd peel chutney too. Ridge gourd stir fry looks delicious. 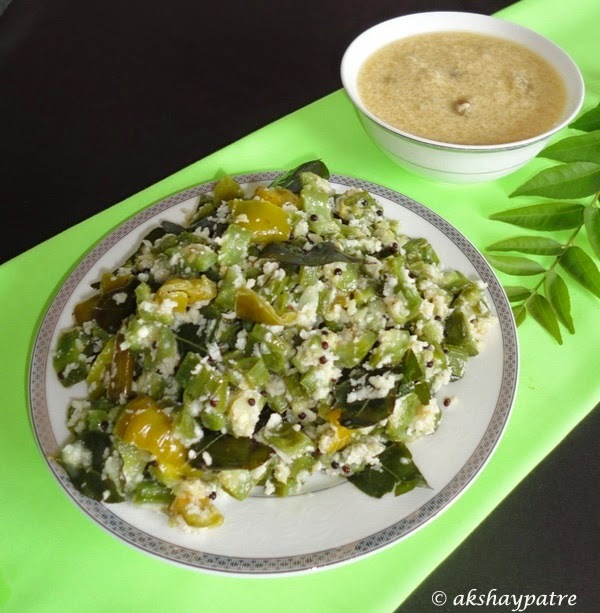 Ridge gourd upkari looks delicious, love this with the rotis..
Looks nice & healthy dish.. Thanks for sharing..